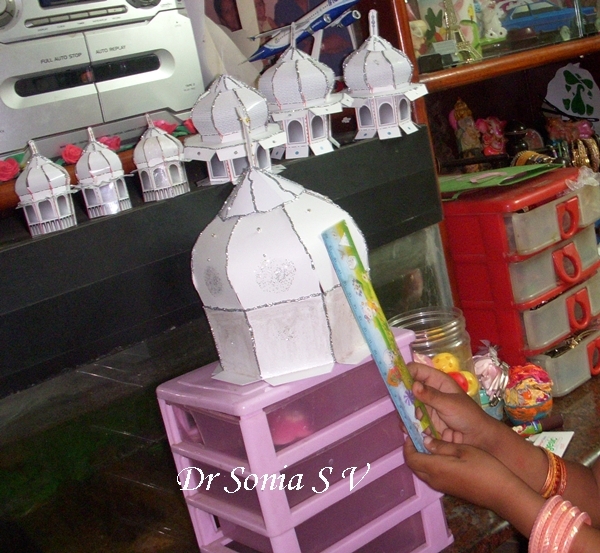 We made a Taj Mahal Paper Modelas part of my daughter's school exhibition .Several themes were there , she chose monuments of India and we had a choice of a chart, model or scrap book. My daughter loves it if it is spectacular so I really went all out and spent a week making this Taj Mahal paper model. 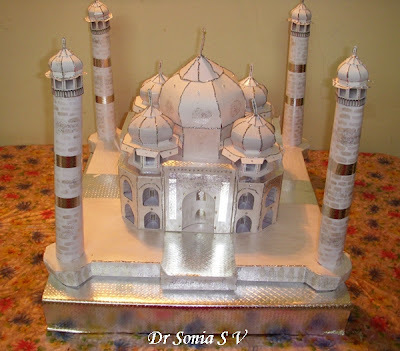 For my friends who would like to know a little bit of the Taj Mahal -The Taj Mahal is a monument of eternal love located in Agra in North India. It was built by the Mugal Emperor Shah Jahan for his beloved wife Mumtaz Mahal who died shortly after giving birth to their 14th Child. The Taj Mahal was built out of marble and precious stones from different parts of India and the world. It took 20000 workers 22 years to complete the exquisite structure. 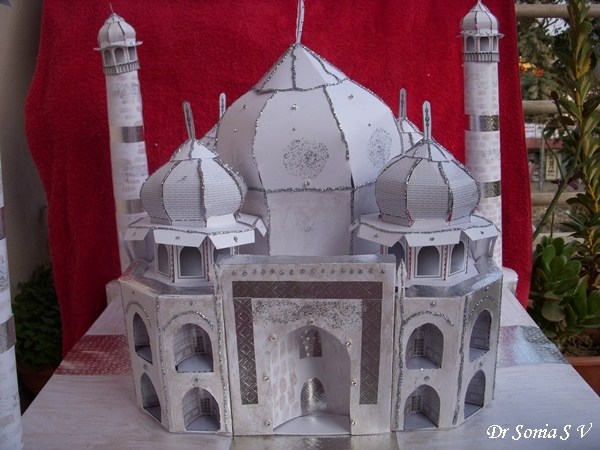 Our Taj Mahal Paper Model is made from thick chart paper and has a thermocol base for sturdiness. The Taj Mahal is so beautifully proportioned the view is the same from all sides and the marble reflects light so magically that at various times of the day the reflecting sun light or moon light gives the Taj Mahal different colors! 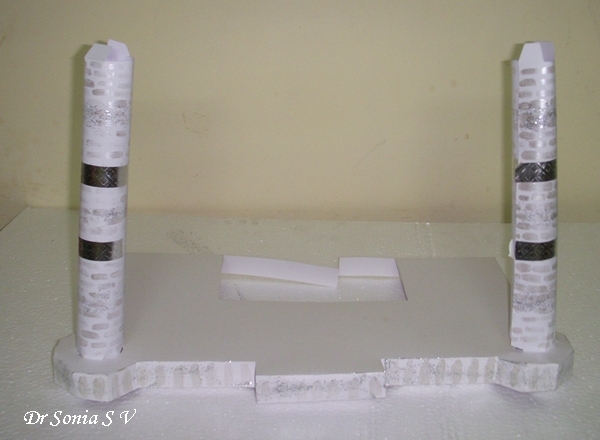 This is the half of the base of the Taj Mahal Paper craft model with two minarets. 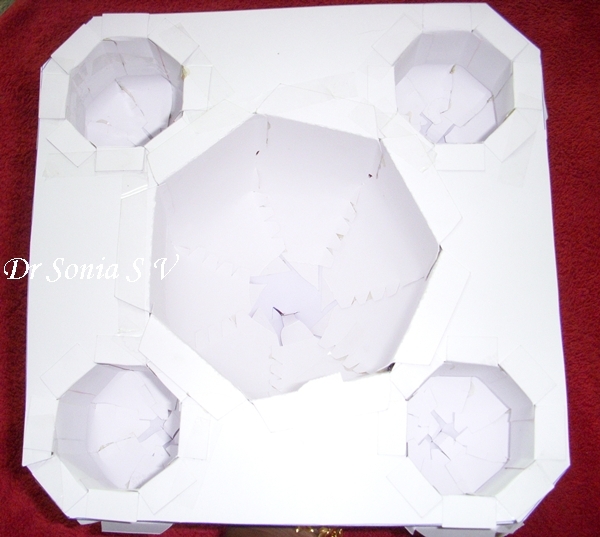 The base of the domed top showing the octagon base of each dome .Since we made it at home my daughter could easily understand the shapes. The model is from Canon. 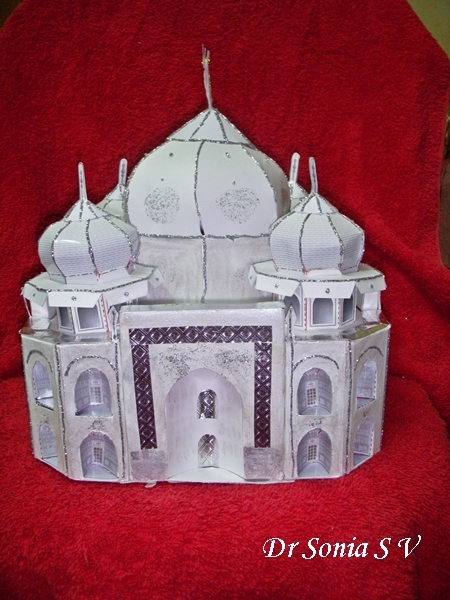 I printed it out as a poster 3x 3, made the template by cutting and pasting the printouts then traced out the actual Taj Mahal Model parts on chart paper and photo-paper. My daughter enjoyed painting the marble texture and helping me join the parts with glue drops!She learnt about the Story behind the Taj Mahal and also about the true structure including the symmetry, the octagonal base , minarets, domes as the model is a true miniature ! 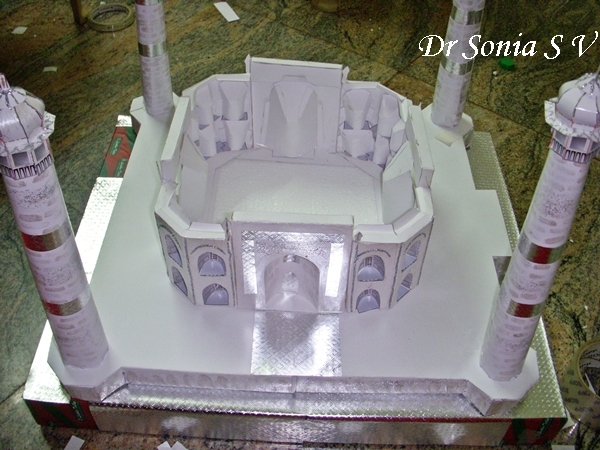 The base with the minarets and the main archway. Here is our dining table where we worked and my little one in the background! Here is my little one measuring the dome! 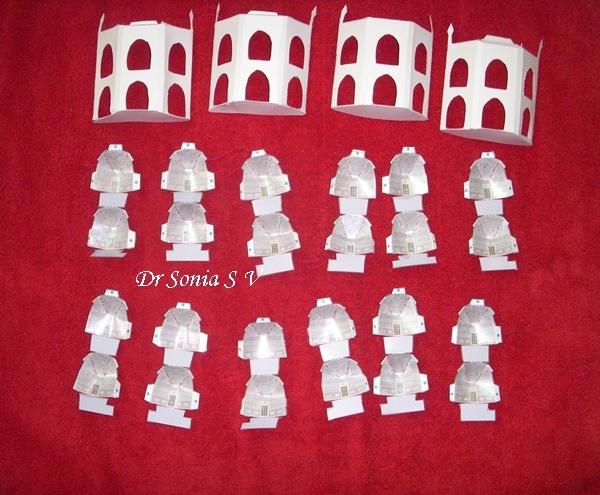 This is how the Taj Mahal Minarets and Central Structure look without the domes. My daughter could really learn about the structure as she was involved quite a bit in the construction. This is the top view of the Taj Mahal domes showing the " filial". It was indeed an ambitious project and as I neared the date of the exhibition there were many panicky moments whether I could pull it off. Fortunately we could complete it and it was a big hit in my daughters school! 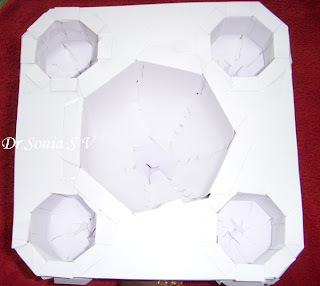 It's really nice Sonia...u know this reminds me of my childhood when I was 6 & my ma had made this huge house with a garden made of paper & it was a huge hit in the school & the princi kept it in her office........im sure ur Taj mahal was a huge hit as well:-)....it's great!!! Thank you Divya. Yes it was a huge hit. My daughter said she received so many compliments from children as well as parents. It was worth the late nights I spent on it! Wow, that's a lot of work but the out come is awesome! 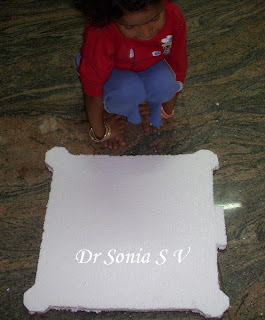 Hi Dr. Sonia, Thank you so much for visiting my blog today. 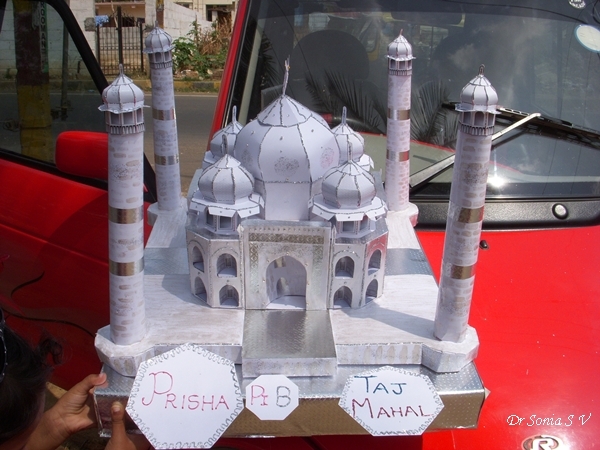 I am quite impressed with the details of the Taj Mahal project you completed. It is amazing! Thank you Helen. I am actually proud of it and it was especially rewarding to see my daughter's pride when other kids and their parents complimented her! Thank you Rae. I wanted it to be as true to the original as possible so that my daughter could learn about this important monument of India. you have a awesome blog here with extremely beautiful cards..very inspiring and uncomplicated..would love to visit you again..am adding you to my blogroll.. This is such an ambitious project , I congratulate you on doing it so well. I am sure your daughter is so proud of you Doctor! This is truly spectacular - so much hardwork and patience gone in there. Thank You Irgri. I visited your blog today and you have some really lovely creations. Thank You Shalini-- It was hard work indeed! What a wonderful and amazing project to make with your daughter. You two have the best time together. I am a follower but I also saw you on MIM. Oh my, want a wonderful creation..... you are so talented. Wow - what a huge project! It really looks fantastic. I bet your daughter was thrilled! this is incredible.. nicely done with all the details too.. wow..
P.S. I was so excited I forgot to tell you that I saw your Work On Make it Monday... Great Job.. I saw you on Make it Monday so had to pop over for a closer look......this is absolutely amazing. You are extremely talented. Glad you shared it with us all. Wow, this is absolutely amazing and the quality time spent with your daughter making this project will have given you both wonderful memories to treasure. I took more than a week to make mine as its huge.. 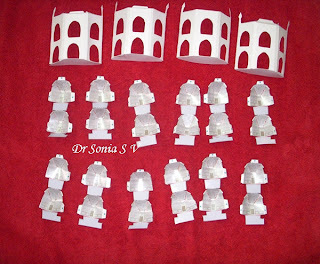 If you are short of time just print the model on photo paper and you will be able to make it in a couple of hours. Use a quick adhesive to save time.The model is from Canon. 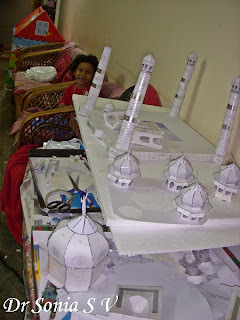 I love this Taj Mahal project, I can see it was very ambitious and a huge amount of work to complete.You did an amazing job on all your measurements and decorations, it's perfect! Hi - what an awesome job! Could you please give some idea of the finished size of the model? Thank You ..Our Model is huge as you can see in the first picture where it is sitting on the bonnet of my car! What a wonderful job you have done. Congratulations. I am based in Manhattan, NYC and post seeing this, am very tempted to repeat it for my 5 year old son's school's International Day. I am organising an India Stall and this I think can be a show stopper. I have the time and the inclination, but the only issue is I havent done anything like this before. So I would really appreciate it if you could help me with a few queries. 1> As I understand I go to the Canon site and download the model. Post that on what paper do I print it? Also what shd be the size of the paper? 2> How did you manage to get the detailing in? Did you paint? 1> As I understand, I go to Canon's website, download the model and print it out. What paper type do you suggest I print it on? What paper size should it be? 2> How did you get all the details in? did you paint them on? Dear Kinkoo so glad you are willing to make this for your son. It looks spectacular so put your heart and soul into it and being in the US you will find it easier to source good quality paper and adhesives! If you print out the model directly from the website your final model will be quite tiny. I think you want to make a big one like I do. 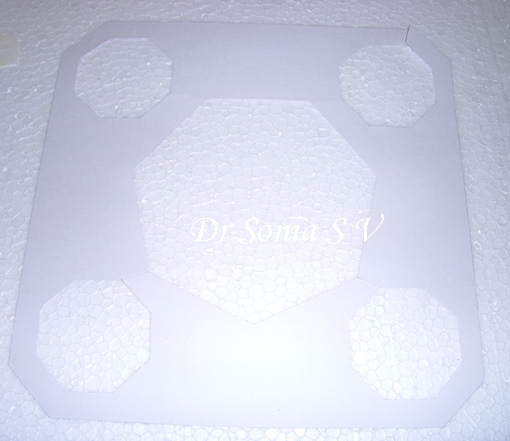 What I did was worked on the printing options and enlarged the templates when I printed it on normal thin paper. I then cut out the templates and used these templates to trace it out on thick chart paper and later cut it out. It was painstaking work but well worth it. 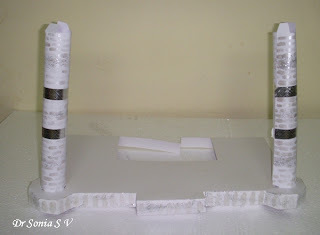 The tricky part was the adhesive as normal glue took too long to stick and was messy so I relied on glue dots-- they were the life saver!Yes I did paint on the details and little one helped in that part.I used pearl white and silver acrylic paint. You will have a wider choice in paints and adhesives since you are in the US.I used glitter glue to add more glamour and some silver paper in places.Do add some rhinestones for the precious gems! Since you are working in white with a 5 year old helper the challenge is to keep your Taj Mahal clean!!! 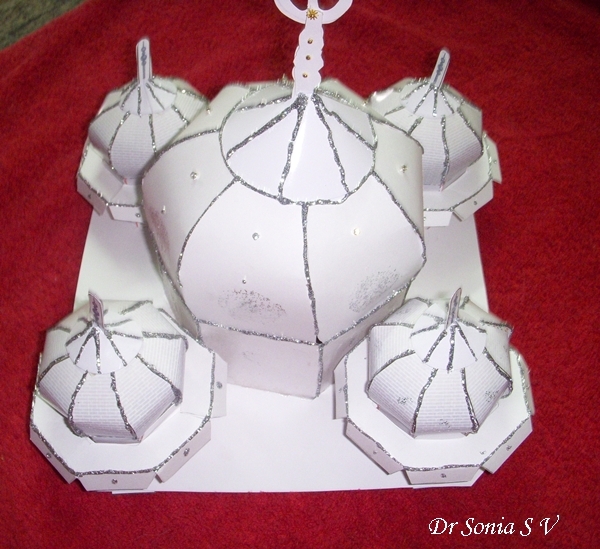 The only other advise would be to take extra care while making the domes as if yuo are not accurate they end up looking silly ... you can see my central dome is not exactly symmetrical-- that was because of a mistake I made while gluing it. 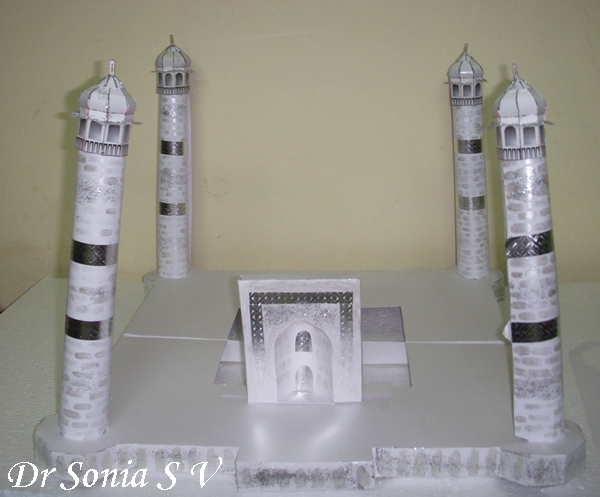 I wish you All the best and do mail me [ soniasv@rediffmail.com ] the finished project photo when you have done it! Thanks so very much for the detailed reply. We were out on spring break and just came back to your wonderful reply. I really appreciate your tips, and for sure will send you a picture. Thank You ever so much for such a detailed, wonderful reply, even if it may have been tiresome for you. We were out on spring break and this was one of the best things to come back to. I will definitely let you know how it all went down. Best regards and keep posting awesome stuff. CAn u please tell me where i can download the model? It's super grand. Your daughter must've been thrilled. Oh yes she was so proud of it!! Sonia!! How did I miss this post!! I am speechless!!! dumbstruck!!! awwwwwwwwwwwwwwwwwwwwwwwwwwwwwwwwwwwwwwwwwwwwwwwwwww!! Thank you Priya..it was a lot of work and I dont know if I would be able to make one like it again! Me and my hubby are amazed! You did a fabulous work with this creation! Applauds all the way from Sweden!!! From Sweden..WOW and thank you so much Susan! Awesome! I have been wanting to do this for a while. I have downloaded the template, but I am just so lost, I am not sure where to start this from. Thanks for sharing and detail instructions, its very helpful! 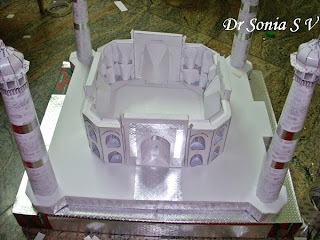 Thank you Savitha..it is a daunting project and I nearly gave up several times while I made our Taj!! since I was a child I dream to visit India one day, and the Taj Mahal is perhaps the first image of India I saw. My grandfather travelled a lot to your country. I haven't visited India yet, but I'll do it, I hope soon. Your stunning creation is something you can be really proud of, both because it is really beautiful and because it is the symbol of eternal love and of a country that has given a great contribution to world culture. I love them (your creation and India)! 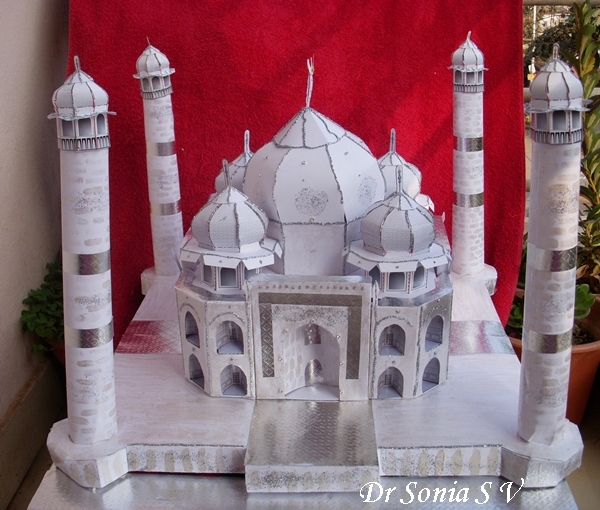 Dr. Sonia: Wow is all I can say for the detailed and beautiful replica of the Taj Mahal. God has given you a gift and a blessing to share with others. You stated something about Canon! Is that where you were able to find this idea? Seeing this country symbol is on my bucket list which I hope to fulfill one day. Continue on with the blessing bestowed you, for you strength will give a reward to others.